Skilfully, the simple, noble style underlines the beautiful cross-vaulted ceilings. Some natural rock formations have been preserved and surprise as contrasting elements, for example in the bathroom. Modern comfort blends with historic style, which still exudes the peace and quiet of this former convent building from the 17th century. The living area of approx. 90 sqm net is distributed on one level on the ground floor and on two levels in the turret. The entrance leads into a large living room with beautiful cross vaults. 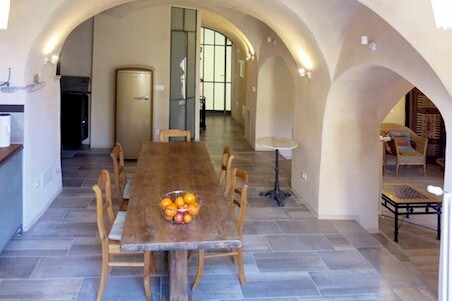 Kitchen and dining area are separated by open arches from the lounge area. The open bathroom is also on this level, as well as the passage to the tower with a spiral staircase. Here is a small bedroom downstairs, as well as a large bedroom upstairs, offering stunning views of the valley and Dolcedo! In addition to the bedrooms in the tower, there is a further sleeping area in the living room, offset slightly downwards. The living room leads directly to the large, partly covered terrace. Here you can enjoy the mild climate outdoors, cook, eat and relax! Wind protected and sunny into the evening, offering a lot of privacy, the terrace merges with the living area once the windows are open. A cellar / storage room in the tower provides storage space. In front of the tower is located another small terrace. 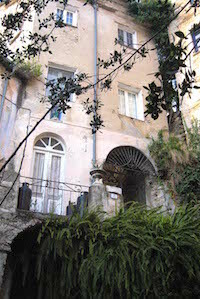 There is also the possibility to acquire a garden plot of about 40 sqm in front of the terrace. The ancient convent building is located in the center of Isolalunga - a very sunny village even in winter and one of the most beautiful places in the Valprino valley with many medieval houses and narrow alleys. The house is just a few meters away from a public car park. In Isolalunga, there is a small grocery store and it is only a 400 m walk away from Dolcedo, the central village of the valley with various shops and restaurants. You can reach the coastal town of Imperia with its beaches, shops and a big yacht harbor in about 10-12 minutes by car.